You know that exercise is the best way to keep your body healthy and in good shape, but you might be apprehensive about joining a gym in your community. A gym membership can be expensive, and working out in front of strangers isn't for everyone. A home gym can be the answer. The following pieces of workout equipment in a home gym can offer a wealth of health benefits from the comfort of your house or apartment. Walking or running on a treadmill increases blood flow, strengthening your heart and improving circulation. Your bones will also benefit from a treadmill. Over time, running and walking increases bone density, which helps prevent osteoporosis. Activity on a treadmill releases endorphins, elevating your mood and creating a positive outlook, so this piece of equipment benefits users emotionally as well as physically. An exercise bike is more convenient than a regular bicycle because it is not limited by weather conditions. On the health front, an exercise bike is an effective way to burn calories and lose weight. Like the treadmill, an exercise bike works wonders for your cardiovascular system, getting your blood pumping, and working out your heart along with your limbs. As a plus, an exercise bike is easy on your joints. This is the ideal piece of home gym equipment for people who are overweight or suffer from problems with their hips, knees, or ankles. 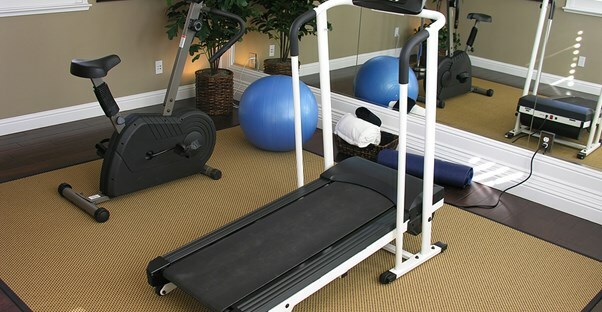 An elliptical is another piece of home gym equipment that has little impact on your joints. An elliptical increases bone density and strengthens muscles. It also works out the entire body instead of focusing on one or two core areas. An elliptical lets you work out the upper body while keeping your lower portion in motion. By keeping an erect posture while performing your elliptical workout, you will strengthen your abdominals. Another plus of an elliptical is that it is easily adjusted to accommodate your specific exercise needs. A rowing machine is a deceptively simplistic piece of equipment. It's easy to use and does not come with many bells and whistles, but it provides you with many health benefits. First and foremost, a rower will burn a lot of calories as you work out. With frequent use, a rowing machine will improve the cardiovascular system, making it a good choice to increase circulation and lung function. Over time, a rowing machine can also tone muscles, giving you better definition. Contrary to what you may think, a weight bench isn't exclusively for body builders. Lifting weights is a great way to strengthen joints and prevent bone density issues later in life. Working out muscles in the upper body also improves mobility in the shoulders, builds muscles in the chest and arms, and helps lower cholesterol levels.